Ace Power Generation Horana was adjudged the winner of the National Safety Award for the Safest Workplace in Engineering Services Sector in Sri Lanka at the National Safety Awards 2010, which concluded recently. The 20MW plant is a part of Aitken Spence Power which operates two other power plants in Matara and Embilipitiya. The national awards, presented biannually, in collaboration with Department of Labour and Employees Trust Fund Board, recognises organisations that achieve excellence in safety in the workplace. This year’s awards included 19 categories, which attracted 42 companies, all of whom were audited. Aitken Spence’s power plants were the first power plants in Sri Lanka to be benchmarked under rigorous global standards in occupational health & safety, environmental management and quality, receiving OHSAS18001, ISO14001 and ISO9001 respectively. “Aitken Spence Power holds an unswerving commitment to maintain the highest global standards in safety, quality and environmental management. Such high standards can only be achieved and sustained with a world-class team who are dedicated to excellence in all what they do”, said Mr. Devan de Mel, Managing Director of Aitken Spence Power. Bringing pride to Sri Lanka, Heritance Kandalama won Asia’s Responsible Tourism Award for large hotel category at the ITB Asia tourism trade show held at the Suntec City Convention Center, Singapore on 21 October 2010. Asia’s Responsible Tourism Awards is organised by Wild Asia and it is the only tourism award of its kind in Asia. This annual award aims to recognize accommodation sector and tour operators in Asia who are making a difference to sustainable tourism. The awards showcase exemplary resorts, hotels and tour operators that are committed to environmentally and socially responsible practices. This year’s awards attracted a larger and more diverse number of participants, from India, Sri Lanka, Maldives, Thailand, Cambodia, China, the Philippines and Indonesia. Every year, the judging panel select two finalists for each category based on criteria such as sense of place, whether tourists understand their destinations in terms of the cultural and ecological context; whether the responsible tourism efforts are long-term; involvement of guests, how much the operators involve their guests in their responsible tourism practices; how much sustainability is part of the day-to-day operations and how the operators strive to improve their responsible tourism efforts continuously. Mr.Jeevaka Weerakone, General Manager, Heritance Kandalama who accepted the award said that “It is a great honour to receive this award and we will continually raise the bar in making Heritance Kandalama an example in Sri Lanka and the world, at the same time developing it into a learning centre for responsible tourism”. Heritance Kandalama, a hotel committed to sustainable practices from conceptualisation to construction to its day-to-day operations was named the winner of the large accommodation category. According to the judges, Heritance Kandalama’s all-round commitment and practices gave it the edge over Malaysia’s Frangipani Resort, Langkawi who was placed second in the same category. In the small to medium category, the Sarinbuana Ecolodge in Bali won the award closely competing with Soneva Gili in the Maldives. Andaman Discoveries from Thailand won the award in the best responsible tour operator category. Mr. Malin Hapugoda, Managing Director of Aitken Spence Hotels commenting on the awards said “Heritance Kandalama is well known for its green architecture and eco tourism practices which have been nurtured since the inception of the hotel in 1994. The hotel has a green philosophy that covers essential responsible tourism practices such as providing benefits to local communities, protecting and conserving natural environment and mitigating climate change. We believe in championing sustainable tourism safeguarding the very own resources that our business is dependent on for the future of tourism industry in Sri Lanka”. He further added “Winning the best responsible tourism award for large scale hotels in Asia will certainly help us not only to project advantages of implementing responsible tourism as part of a tourism business strategy but also to promote Sri Lanka as a sustainable destination”. Theward received by Heritance Kandalama has given Sri Lanka tourism a boost to project its image as a responsible tourism destination. Dr. Nalaka Godahewa, Chairman Sri Lanka Tourism sharing his views on the award commented, “I understand that this year’s awards attracted a larger number and a more diverse group of participants, from India, the Maldives, China, the Philippines, Irian Jaya in Indonesia and also from Sri Lanka. This is a great achievement for Sri Lanka Tourism especially at a time when we are working towards accelerated tourism development with sustainability and responsible tourism in mind. I am thrilled to know that Heritance Kandalama was named the winner of the large scale accommodation category”. The event was co-organized by ITB Asia, Wild Asia and The Green Circuit, and brought together sustainable tourism practitioners to share, engage, learn and be inspired to make a difference. 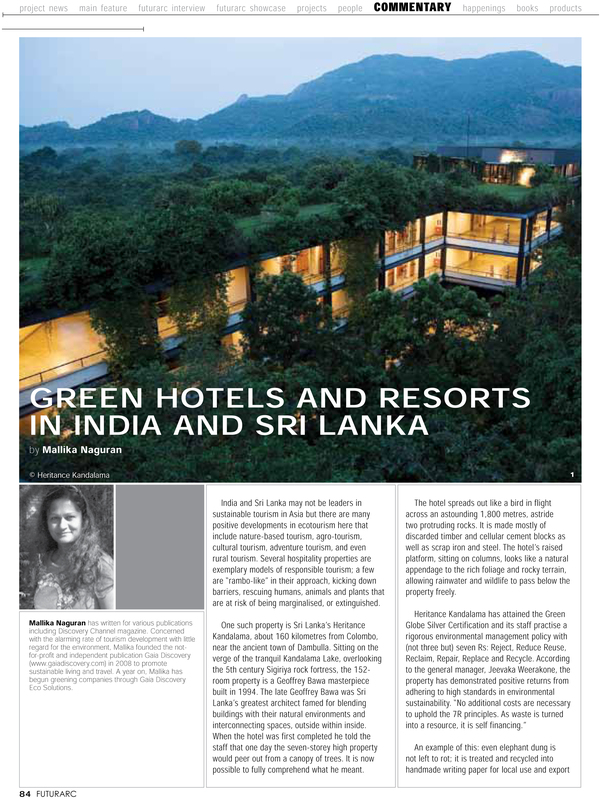 Heritance Kandalama has won a large number of awards as one of the most eco-friendly hotels in the world. It has set precedence to other hotels on how they too can be effective responsible tourism players by contributing in terms of conserving the natural environment, protecting bio diversity, empowering local communities, supporting livelihoods dependent on tourism, preserving local traditions, arts and crafts and mitigating climate change especially by using bio mass as renewable energy. As it celebrates 55 years, the printing company that had its beginnings as a small, in-house printing operation for the group’s stationary has grown and flourished, becoming one of the best printing and packaging companies in Sri Lanka and catering to both the local and the export market. Although it started as the in-house printing division for Clark Spence & Co., printing the company’s stationary requirements, the 1960’s saw a growth in the company’s outside business that prompted a shift to Colombo from its original headquarters within the Galle Fort. Aitken Spence Printing has an expansive product range that runs the scope, from coffee table books and corporate publications, to packaging for a varied customer base, encompassing a diversity that covers the breadth, from tea and FMCG to garments, cosmetics and pharmaceuticals. Aitken Spence Printing prides itself on being able to cater to customer requirements, a trait that has made them pioneers in many areas. Not satisfied with being one of the first printing companies to establish itself in Sri Lanka, the company later branched out into the global packaging segment that continues to be highly lucrative, bringing buyers, from UK and Europe. Backed by an asset-rich parent company, Aitken Spence Printing not only attracts the industry’s best talent, but also enables in-house training, that ensures that customers continuously liaise with a highly skilled technical team to provide the customer an unparallel service. 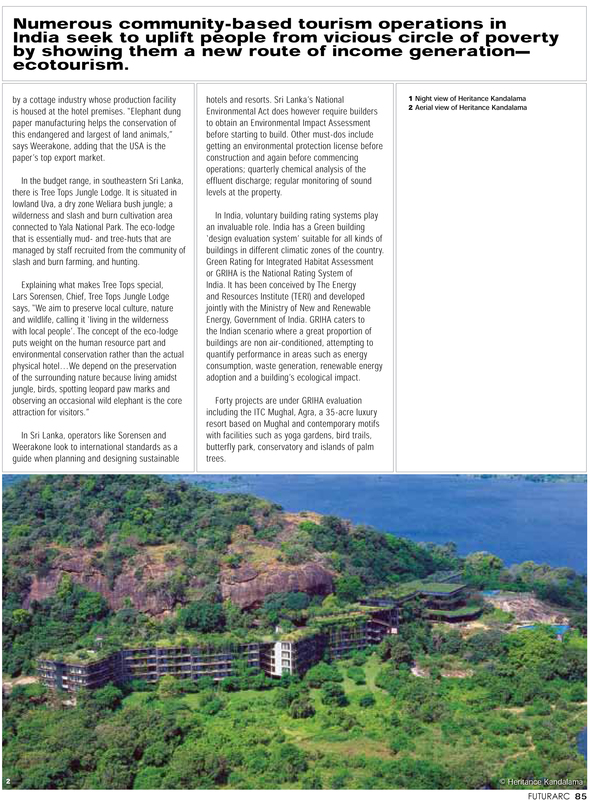 Heritance Kandalama appeared in FuturArc, a regional architecture publication. It is a quarterly journal that showcases new progressive architecture in Asia-Pacific region. Recognizing the significant impact the built form has on society and the environment, FuturArc advocates architecture that demonstrates creativity, social responsibility and sustainability. It encourages architects, engineers and developers to become innovators in design and early adopters of technologies.